Dragon delivers a knockout punch to Star which shocks Rock as this attack seems completely unprovoked. Star’s mask is removed and Dragon reveals that this is an imposter and he noticed that this person was too tall and heavy to be the genuine article. He suspects that he is actually Kill-Cat but cannot positively identify him. Rock points out that the Kid Avenger could but Dragon is unwilling to make him give evidence about his former partner but is confident they can nail him one day. Dragon then makes a phone call to Alex Wilde to catch up with his good friend but Alex is not exactly thrilled to hear from him. She is annoyed that he never told her that Chris Robinson used to be Star but Dragon replies that giving away secret identities is frowned upon. Alex momentarily lets Dragon think that it was her that gave him the videotape of Rapture and Peter Klaptin before revealing that it was actually Ray Wong that was responsible. He also filmed Captain Mendosa talking to Horde and the Chicago Police Department are now looking to get him kicked off of the force. Other problems back in Chicago are revealed such as; William Jonson and Rita Medermade remain missing, CyberFace is apparently still alive, She-Dragon is improving but Horde has marked her for death and the Vicious Circle’s miniaturised members have completing replenished their ranks by breaking into prisons. Stephenson comes to speak with Dragon and is asked for permission for an S.O.S. team to travel to Chicago to deal with these problems. This request is turned down as Stephenson requires Dragon to lead a unit to the small country of Lieberheim. The nation’s ruler, Dread Knight, has gone insane and is killing his followers. The S.O.S. is to travel to Lieberheim and simply kill Dread Knight which takes priority over any problems back in Chicago. Dragon gives Alex a number where he can be reached before heading off to join his team. Dart is thrilled to finally get clearance for active duty and goes to speak with SuperPatriot. She says that although Rapture’s death was hard for them to deal with, they must move on with their lives and carry on the fight. SuperPatriot talks about a more innocent time where he and the Liberty League clashed with Dread Knight. Barbaric apologises to Dragon over doing a toy deal despite his orders not to get involved in such a merchandising deal. However, he points out that the increased publicity he got the S.O.S. has enabled them to ditch the strict dress code and Dragon no longer needs to wear a costume. Barbaric then questions Dragon’s wisdom in bringing along company when he was struck in the flying saucer with Smasher as it would have been a perfect opportunity for him to make a move. The S.O.S. is gathered together by Stephenson and Hawkins but when Dragon arrives, he is less than impressed with the team assembled. 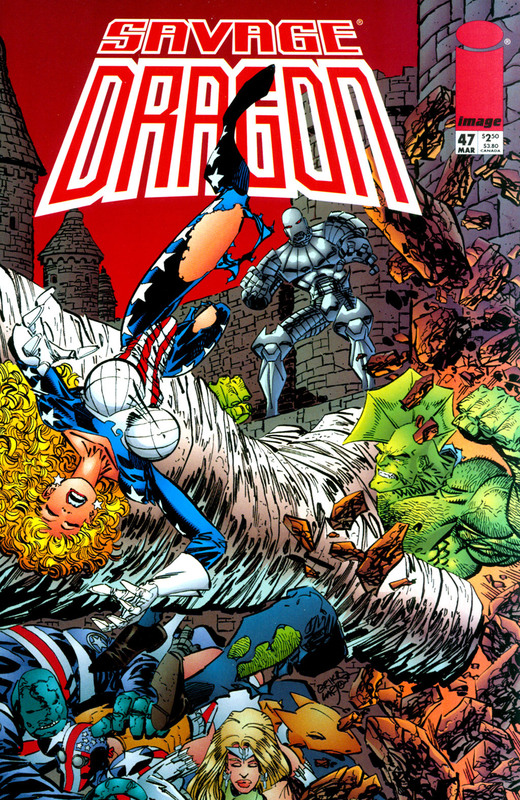 Dart being included when her weapons are useless against a man in armor is questioned, Zeek has had limited training and Horridus is hardly a formidable superhero. Dragon fears that he is no longer really in charge but Stephenson offers him assurances to the contrary. As the heroes board a flying saucer and head towards Lieberheim, Dragon asks that his teammates all look after themselves as he does not want a repeat of Rapture’s fate. He is pleased when life signs in Dread Knight’s castle are minimal but he soon grows annoyed. SuperPatriot points out that Dread Knight is a master of robotics and that his minions are likely an army of robots, information that Dragon should have already been privy to. Horridus is left to defend their vessel while the rest of the S.O.S. engages the Dreadheads, a huge army of powerful robots. Dragon breaches the castle where he confronts Dread Knight who is accompanied by the same Big Mummy that he and Hellboy once fought. Zeek attacks the Big Mummy which leaves Dragon to combat Dread Knight. The villain soon takes off and the Kid Avenger is dispatched to intercept but as the pair fire at one another, a blast is ricocheted off. A powerful energy blast burns off both of Dart’s legs which leaves her unconscious with SuperPatriot trying desperately to save her life. Dragon leaps at Dread Knight and repeatedly pummels him until his helmet pops off. Dread Knight is revealed to have been long dead and that his armor was working independently using its wearer’s branwaves to function. The S.O.S. flees the castle as Dread Knight’s death triggered a countdown that activated a self-destruct. All of the Dreadheads were either blown up or shut down when the machinery controlling them was destroyed. Dart’s wounds were cauterised by the heat of the blast but she has been left in a state of shock.